In Christian history, Mary, the mother of our Lord, seems to have been thought of in one of two ways. 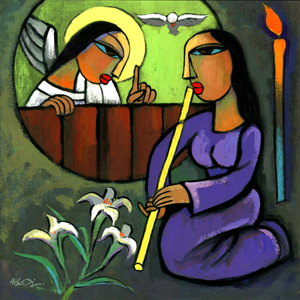 One way has been to see her as a super-saint, imparting perfection to her perfect son, Jesus. The other has been to see her as a more or less clueless surrogate mother. As we see from today’s gospel lesson, both views are wrong. Mary was a forgiven sinner--a saint like all who believe in the God revealed in Jesus. She was an ordinary human being with an extraordinary faith from which we can learn much. And she was an ordinary human being with a sometimes shaky faith, as we see in today’s gospel lesson. And because of the doubts and fears with which she sometimes wrestled (here and here), Mary can also be a source of comfort to we ordinary saints who sometimes wrestle with doubt, uncertainty, or fear. And she also, I believe, could easily understand the feelings of Moses back when, at a burning bush in Midian, God called Moses to go to Egypt and lead God’s people to the promised land. Moses saw the personal danger in such a mission and, in the face of God’s persistent call, told God, “Pardon Your servant, Lord. Please send someone else” (Exodus 4:13). In today’s gospel lesson, God calls Mary to do something dangerous: Although a virgin, she was to brave the condemnation of those who, when they saw she was pregnant, would conclude that she’d committed adultery and be justified under Judean law in stoning her to death. Yet, despite the dangers, her fears, and her misgivings, as we know, Mary persisted. She kept trusting in God and gave birth to Jesus. Now, this is no small thing. In those days, abortion had no stigma attached to it. And in the larger Roman world under the rule of which first-century Judea lived, it was common for unwanted babies to be abandoned in a wilderness where animals and the elements would do their worst to the child. In a world in which such options existed, who knows what temptations may have accosted Mary? Of course, had Mary refused to give birth to the Savior, God could have found another way to bring salvation into the world. The Lord with the power to cause dumb stones to praise His name if no human was allowed to do so (Luke 19:40), would have found a faithful virgin to receive the Son the Holy Spirit intended to conceive within her. But God chose Mary and, as we will see, she accepted His choice. Well, consider this: What if the baby about to born to inherited twenty-three chromosomes each from Joseph and Mary? Not only would the child have inherited Joseph’s brow ridge or Mary’s eyes, he would also have inherited what every one of us inherits from our parents: Sin. If a sinless human being was going to make atonement for our sin by sacrificing Himself on a cross, that human being couldn’t be born in the usual way. God the Father would need to create the human race all over again. It’s only through Jesus, this new Adam (1 Corinthians 15:45), that God could usher those who trust in Jesus into His new creation (2 Corinthians 5:17). For this new creation to get its start, God needed a virgin’s womb. The word translated here as troubled is, in the Greek in which Luke originally wrote his gospel, “διαταράσσω.” Literally, this means, “distressed to the very limit, upset to the core of one’s being.” What’s interesting here is that Mary’s distress isn’t that she’s seeing an angel. Her distress is what the angel Gabriel tells her: “You are highly favored!” he says to Mary. Listen: If you want an easy life, you don’t necessarily want to be one of God’s favorites. When you’re one of God’s favorites, one of His chosen ones, chosen not because of anything good you’ve done but because you dare to turn from our own ways and dare to surrender your life to Jesus Christ--to believe in Him, God is going to make you part of His mission and purposes in the world. You’ll be called by God to share His grace with others, speak His good news to the lost, the spiritually dead, and stand with the lonely, the despised, the neglected, the poor, the victims of the world’s injustices. As the apostle Peter tells we believers in Jesus: “...you are a chosen people, a royal priesthood, a holy nation, God’s special possession, that you may declare the praises of him who called you out of darkness into his wonderful light” (1 Peter 2:9). The apostle Paul puts it more plainly in 2 Corinthians when he says that if we have been made new by God’s grace through our faith in Jesus, we are Christ’s “ambassadors” (2 Corinthians 5:20). When we confess faith in the Savior Who saves us by His grace, God gives us a job. For the disciple of Jesus, cruise control, spectator-only faith is not an option. Mary was agitated to her core. By what God was calling her to do. When is the last time you let God agitate you to the very core of your being? When is the last time you read a passage from God’s Word and sensed God telling you to do some hard thing you didn’t want to do? When is the last time you were in a Sunday School class, a small group, or worship and sensed that God was telling you to trust Him in doing something that could entail rejection, heartache, or sacrifice? If you’ve ever experienced these feelings in the face of God’s call on your life, you know what Mary was feeling as she heard Gabriel’s words. And if you haven’t experienced feelings like these in a while, it’s probably time that you stop and listen for God to agitate you in your discipleship again! The Church needs to be filled with disciples agitated by God’s call on their lives! And, in the end, this is what is so remarkable about Mary. She submitted to the agitations, the uncertainties, the pain that would come to her as she said, “Yes” to the Savior Jesus. She submitted to them because she knew that eternity belongs to those who trust God and seek to do His will. This past Wednesday, as some of you know, one of my seminary professors, Merlin Hoops, died. Merlin Hoops didn’t always have an easy life. A daughter has developmental disabilities. His wife is afflicted with a degenerative disease that has bound her to a wheelchair for many years. Along the way, as some of you have heard me say, ill-informed Christians told him that the tragedies that befell him happened because he was not a faithful Christian. But not once did I ever see Dr. Hoops lash out at anyone. Not once did I see him be anything less than a gracious and encouraging Christian disciple, a loving pastor, a dedicated prayer warrior. He saw his work as husband, father, pastor, and teacher as holy callings to which God had called him and so far as I ever observed, never once wavered in his discipleship. He laid his suffering before the Lord and found strength and peace in the One Who had claimed him as His own in Baptism. In the coming year or in whatever time God gives to us on this earth, individually and as a congregation, when the faithfulness to Christ to which God calls us, causes us to feel agitated, afraid, or uncertain, don’t throw in the towel and give up on the whole discipleship thing. Instead, throw in with Jesus. *The words for Spirit, breath, and wind are the same in both the Hebrew in which the Old Testament was written and Greek, the language in which the New Testament was written. In Hebrew, the word is ruach; in Greek, the word is pneuma.